Tips & Techniques: A spreadsheet app from Adobe? A spreadsheet app from Adobe? Yes, it's true. Adobe has created a spreadsheet program, of all things. It's an on-line application called Acrobat.com Tables, currently in early pre-release beta on Adobe Labs. 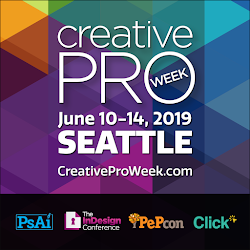 It joins Adobe Buzzword and Acrobat.com Presentations, which I've written about previously. All three applications are intended to be collaboration tools, allowing multiple users to work simultaneously on the same spreadsheet, word processing file, or presentation. See this press release for more information about Adobe's direction with all of this. More background about the development of Tables can be found here. You cant work on one document together at one time like in Google. One can edit, the other one can watch until the editor saves. Correct me if I'm wrong, but this hasnt changed for Acrobat Tables I think. 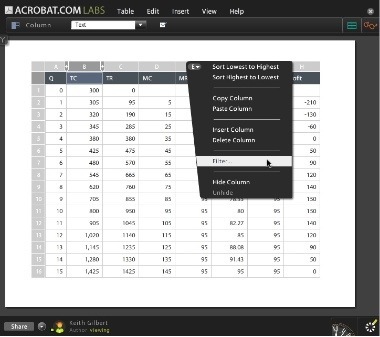 With Acrobat Tables, multiple authors CAN edit a table simultaneously, and each screen is updated in real time. Again, this is early beta, unfinished software, but my brief tests of the collaboration features so far were pretty slick.